Below you can find driving directions from Google Maps to help you get from Margate to your nearest Fix Apple Now store, situated in Weston. You can either copy the driving instructions below or click here for a larger map and driving directions. Fix Apple Now is for you if you need to fix, mend, repair, restore or replace your Apple device in Margate. We have been solving complex problems with iPhone 4, 5 and 6 devices, iPads, iPods, MacBook Airs and Pros and Apple Macs for many years and have some of the best engineers in the business in our team. You can rely on us to resolve a host of common problems related to Apple devices, including unresponsive touchscreens, red screens, frozen and cracked screens, boot loop, devices not charging and machines not switching on or off, so why not find out more about our services and give us a call? You can count on us to deliver the fantastic service you've been looking for. We always strive to fix and get your device back to you as soon as possible so you only have to be without it for a short period of time. 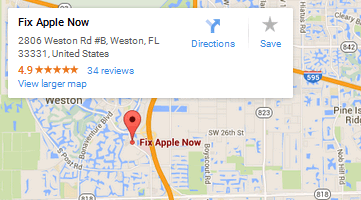 To learn more about the vast range of Apple repair services we offer, contact us today.